Google Play Store is undoubtedly the most popular app store for Android smartphone but it is certainly not the best. The reason being not all the apps are available in Google Play Store. Sometimes, not all the apps in Google Play Store are not geographically available everywhere. Such conditions of Google Play Store have made the users shift to other alternatives of it. This article discusses alternatives of Google Play Store for Android smartphone. It is one of the most popular app stores of Android smartphone. It has all the apps that you need on your smartphone and you can also explore many other apps here. The most popular categories of Aptoide are local top downloads, trending applications, latest applications, games, and Aptoide recommends. Apart from providing a platform for downloading apps, this app store also maintains several blogs for keeping its users informed about the latest app in the town. You also have the option of toggling on the adult content for downloading adult apps on your smartphone. It is very similar to Google Play Store but it has a more professional look. The developers of Mobegenie claim that it is better than Google Play Store because it has the feature of ‘intelligent recommendation system’. By understanding the interest of the users, it recommends the best app that can work for them. It has very sophisticated user-interface. And apart from providing the users with regular apps and games, this app store also stores a lot of other downloadable items like wallpapers, videos, and ringtones. The app store can also be used on your PC which makes managing the apps in smartphone very easy. Also, Mobegenie gives the backup option to its users. TutuApp is an app store that works for both Android and iOS device. This app gives the users to download and install premium apps for free. TutuApp is available in a free version for the Android users. The downloading speed of TutuApp is very fast and one can download many apps within a minute. Just like Appvn, TutuApp also stores a modified version of the apps in it. You can easily find the apps which are not available in Google Play Store easily here. The latest version of TutuApp is V2.2.66. It is a lightly weighted app and won’t consume much of space in your smartphone. This app store offers its users with both free and paid Android app. It maintains one of the largest community and the users help other users to choose an app by rating it. The apps which are listed in SlideMe are manually approved before they are made available for the downloading purpose. You can filter the apps available here on basis of the latest apps, recently updated apps, and the most popular apps and of course the app which is given the highest rating. The apps are listed on basis of different categories which makes browsing easier in SlideMe. The app store supports a number of languages and therefore no matter where you are from, chances are high that you can find your language support. Also, many currencies are accepted here to make purchasing of paid apps an easy process. If Google Play Store has failed to meet your expectation, then you should try Appvn. From this app store, you can download paid apps at free of cost. Appvn regularly updates the app which is available there to make sure that the latest version of the app is available to be downloaded. The collection of apps and games available in Appvn is appreciable. Along with the original version, it has tons of modified and older versions of those apps. This gives the users the freedom to download a version of their choice, something which is not available in Google Play Store also it requires google play services to function. It has a simple user-interface. Also Checkout How to protect your child from cyber vulnerability using Android keylogger? 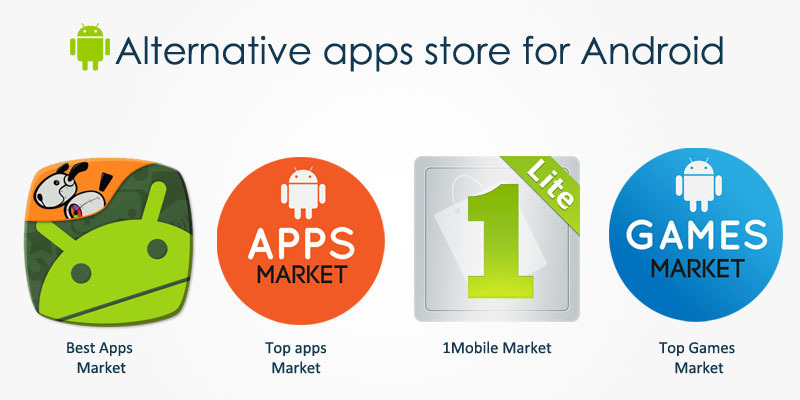 These five app stores are one of the most popular app stores which are available for the Android smartphones. Also, make sure an app has a good rating before you download and install an app. The next time, when an app is not available in Google Play Store, you now know where you have head to!